My dad runs the website for the DH Lawrence Society. Easy. But when I was visiting at the weekend, he still wanted me to sit next to him while he published the programme of meetings for the year. I sat next to him, and he did it all himself. I did nothing at all to help. Yesterday I spent a long time looking at this Denki Puzzle at the Design Museum. 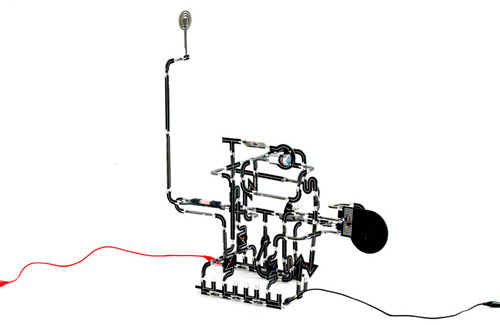 It's a working radio made up of circuit board pieces whose form indicates their function. So the LED looks a bit like a light, and the capacitor looks a bit like a battery. I know nothing almost nothing about electronics, but I reckon I could build a radio using the components designed by Yuri Suzuki. I might want someone to sit next to me, but I probably wouldn't need a training course. In DH, since we switched our main content management tool for dh.gov.uk to WordPress, we've expanded the range of people who can publish DH content. We've been able to do this because it's now dead easy for people to do it. WordPress removes complexity for the editor - form relates to function pretty well. Now we have lots and lots of people publishing digital content. Our transparency pages, for example, have about 50 different editors, each with (controlled) publishing rights for certain content, including FOI notices, minutes of board meetings, and statistical releases. Our editors don't need to understand much about digital to do their jobs, they just need to be able to follow the same set of instructions that I gave to my dad. I'm expecting the publishing tools for the Inside Government bits of GOV.UK to be a bit like the Denki Puzzle. So that our editors won't need a manual and a training course to do their jobs. From what I've seen, it's looking good. I was teaching my Dad how to use Android and various apps and how to think about things differently. We ended up working to the old medical adage of 'see one, do one, teach one' (he has to show my Mum how to use it... I don't have the patience for this!). Now, he's got the hang of it, he's started a blog on it, using it for emails, reading the paper and books, looking at maps, etc and his tablet has become part of his routine now. He's even overcome the fact that his fingers are enormous and tapping and sliding a touchscreen weren't that intuitive to him at first. Once you prove to someone that the technology is simple to use and will make a difference to their lives and they can see that themselves, then the hand-holding pays off and you've overcome most of the hurdles in the way.